A few weekends ago I had a great evening downtown. It began with a meeting to "Save the State Theater" at Cedar's Lounge. Then moved to The Upstairs Lounge for some italian greens and stuffed hungarian peppers. Then we finished up the night at the new Boxcar Lounge, located down by the river next to the Old B&O banquet hall/train station. Lots of lounging going on I guess. So then we sat up at the bar and start telling stories. Three other bloggers were at the bar with me. Six months ago, I didn't know any of these people. We were talking about the State Theater when the bartender chimes in about how he used to be a projectionist there. In fact, he used to be a projectionist all over Youngstown, and told four stories about the different movie houses in the city where he used to work. The talk of blogging came up, and a discussion about how to immortalize all of these stories. It turned out to be a collection of postcards from the early 20th century - all featuring scenes in Youngstown. Some of the postcards pre-1920s showed buildings downtown, with most of them still standing to this day. We talked of speakeasies in the prohibition era, and Ytown's title as "Little Chicago" since it was a hangout at some point for Al Capone and others from those days. The bartender told of another story, how back in the day, there were some stores downtown that contained secret entrances, with access rooms beneath the sidewalk on federal street. One of them was a ladies' clothing store, and inside one of the dressing rooms was the secret entrance. And so the stories kept coming. And the relization that a blog would be a great place to archive all of these stories. Fast forward to the next day. I made my first trip to the archives of the Mahoning Valley Historical Society. Filled with ancient photos, fire insurance books with maps of the downtown as large as a kitchen table, industrial archaeology artifacts, and many many other pieces - each with a story behind it. And so I asked the staff while I was there about the possibility of bars under the sidewalk back in the day. A possibility perhaps, but a component of our downtown's history makes the possibility all the more interesting. For it turns out that when John Young planned out the town over 200 years ago, Federal Street was two different widths as the road continued away from the central square. It was 100 feet across from the center of town, and then somewhere around Phelps Street, the road narrowed to 60 feet. So then as the city exploded in size, more space was needs for roads to accomodate more trollies, cars, and pedestrians. The rest of federal street was "widened" to 100 feet, but the problem was, all of the buildings were still there. So they cut off the tip. Many of the buildings then which were now facing federal street had 20 feet of the building chopped off, and a new facade put in place. That is why so many buildings along that street have terra cotta facades. When the buildings were "resized", the en vogue material at the time was terra cotta. And the strange thing is, the foundations of the old buildings remained. 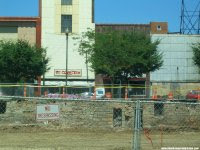 As the facades pushed back, walls to the sides remained, but placed under the sidewalk. Where previously there was a front staircase entrance (think nyc bodegas), was now paved over, with possible space underneath. So quite possibly, the story about the underground and hidden drinking establishment is true. Can you see the doors that are below the street level? But if it wasn't for that night in the bar, that story may have been totally lost to my memory. Other programs recording the oral histories of individuals have been a success, but are located on more traditional forms of media, often archived in a library. This project may enable us to share Youngstown's stories around the world, and for generations to come - and all one needs is an internet connection. Here is a good one from the Center of Historic Preservation at YSU that seems to have run from 1974 to 2003. 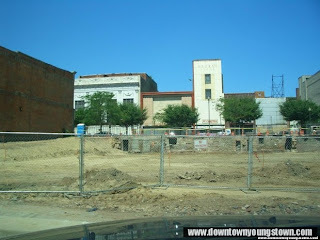 Youngstown Stories is a new site, and a work in progress. I went to the Historical Society archives when I was looking for history on the Wick Mansion at YSU. I was working on a story for the Jambar about local haunted houses and found out that George Wick went down with the Titanic after his house was built. Here's the link if you're interested. Excuse the crappy writing. There is a really beautiful memorial built for George Wick at the Oak Hill Cemetery. I would highly recommend walking around there - it is filled with stories..."to be saved forever." A few years ago, at the Center for Working-Class Studies, we started talked about creating an online Mahoning Valley stories & memories site but just never got to the point of making it happen. We do have a few online "exhibits" on local history on our website, under "Working-class culture in Youngstown." These were created by students in the courses on Youngstown history that John Russo and I taught, during the period when we were writing our book, Steeltown USA. Many of these exhibits grew out of our students' family history projects. They found stories worth telling just by talking with their parents and grandparents. Our site is not functioning fully these days -- it's being rebuilt, so have some patience with these. That is amazing. I am so happy to see such wonderful historical stories. I cannot wait to look at the youngstown historical blog.